Sheila Ngọc Pham recounts discovering her mother’s past as a singer in Hoa Tình Thương (The Love Flowers), an entertainment troupe that performed to boost morale during the Vietnam War. I knew my mother had been a singer in Vietnam, though I don’t remember her ever telling me this directly; I think I overheard some mention of it in my childhood. For the longest time I carried a mental image of her singing in a smoky nightclub in Saigon, a slender young woman with long black hair in traditional áo dài dress. Somehow, it never occurred to me to just ask her whether this was true…until recently, that is. I produced a radio documentary about Vietnamese music for ABC Radio National called Saigon’s Wartime Beat; in doing this, I finally heard her incredible story. The sort of music I gravitated towards in my teens was American folk-rock from the 1960s and 1970s by artists like Bob Dylan and Buffalo Springfield. One of the first CDs I ever bought was the Forrest Gump soundtrack and it was the start of a musical love affair. I even spent a chunk of my early twenties being a music journalist to learn as much as I could about popular music. Yet when it came to the music of my heritage I drew a blank. At best, I was dimly aware that much of what I loved most from the 1960s and 1970s was inextricably linked to Vietnam itself, because these songs were written during a time when young American and Australian men were being conscripted to fight in an unpopular war. But how did young Vietnamese men and women feel about the war? Did they use rock music to express their feelings? And, if so, what did it sound like? The songs my parents listened to were either mournful ballads from the pre-war era, which would send me to sleep, or what seemed to be 1980s-style synth-driven Vietnamese pop. I never heard anything reminiscent of the kind of music I actually liked. So, for me, Vietnamese music was like muzak: sounds I heard in the background while busy doing other things. 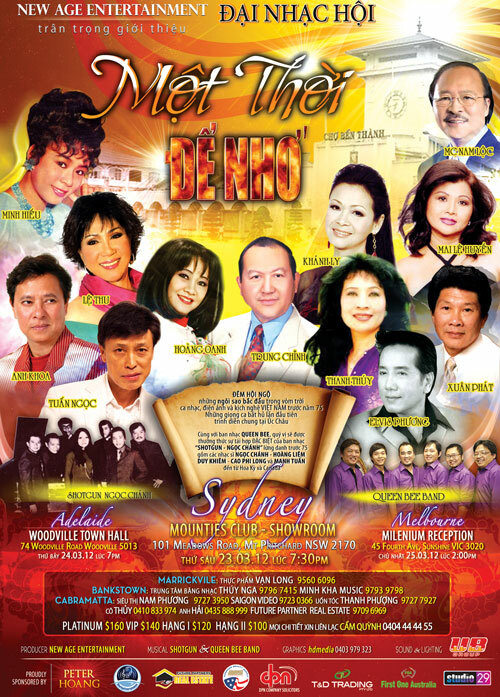 A few years ago there was a Vietnamese gala concert called Một thời để nhớ (‘An era to remember’) that took place in The Mounties Club in western Sydney. The era in question was the Vietnam War, and the line-up included famous Vietnamese singers like Elvis Phương and Mai Le Huyen. Everyone had flown to Australia for the tour – mostly from the United States, where the majority of high-profile Vietnamese entertainers live. Some have also since repatriated to Vietnam. During the war, when Saigon had a vibrant music scene, these singers would have performed in dancehalls, live-music venues and nightclubs throughout the city. But in Australia, the tour took place in suburban community clubs close to where their Vietnamese audiences now lived. The night of that concert they performed lot of upbeat pop music, the kind I’d grown up hearing. When I listened closely, however, probably for the first time, I also caught intriguing overtones of rock. Themes of death, heartbreak and separation surfaced again and again. Perhaps I was hearing the songs as my parents did. 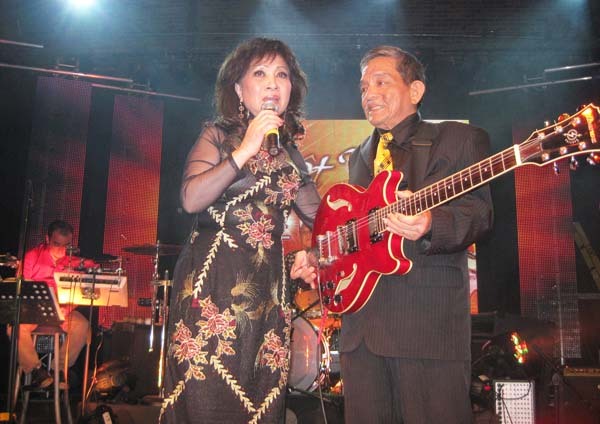 One of the performers at the concert was Hoàng Liêm, an ace guitarist in his mid-seventies. His legendary band, Shotgun, had formed when South Vietnamese soldiers were confined to their army barracks during the Tết Offensive in 1968. The members of Shotgun performed for their fellow soldiers as well as civilians in Saigon, and only stopped playing when the war ended in 1975. He’d kept a low profile in Saigon after the war ended because, unlike all the others who performed that night, he was the only one who had stayed on in Vietnam. His performance at Một thời để nhớ was his first public show in decades. Excited by everything I’d seen at the concert, I came home to tell my mother what I’d seen and heard…and that’s when I started to learn about her past. I discovered she actually knew Hoàng Liêm: they’d performed together during the war to entertain Vietnamese troops. 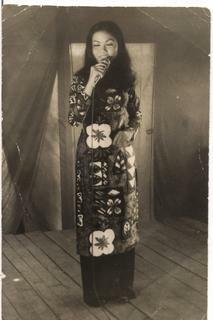 From 1970 1973, my mother – Trần Thị Kim Thoa – was part of a large entertainment troupe called Hoa Tình Thương (The Love Flowers). It was made up of civilians and army personnel, including members of the band Shotgun. Hoa Tình Thương played to soldiers all over South Vietnam – at army hospitals, bases and camps – performing mainstream Vietnamese rock and other popular upbeat styles to boost morale. At the age of 18, performing on the road, my mother had the experience of a lifetime. She made a good living to support her mother and sisters (her parents had separated). Travelling across the country with friends, Hoa Tình Thương performed in towns across South Vietnam and even went to places that had seen heavy fighting, dangerous areas haunted by the ghosts of dead soldiers. “Sometimes you feel worried,” she told me, “but after a couple of times you feel alright because you think, ‘It’s okay’. Sometimes they hide us in the tunnels [because] of missiles…we [would] run to the tunnels and not perform. One lady peed in her trousers because she was so scared! Sometimes you’re shaking but after that you forgot and you go again and again…for three years.” After three eventful years with Hoa Tình Thương, an opportunity arose for my mother to be in the chorus of a new musical variety program for the only television channel in Vietnam at the time. The program was fully funded by the South Vietnamese Government. She jumped at the chance. South Vietnam’s most famous singers performed on the show, which was all about disarming Communist soldiers and encouraging them to drop their weapons and defect. For the South Vietnamese, one of the best weapons they had left was vibrant contemporary music; it was something they had that the Communists didn’t. The show started broadcasting in 1973. By this time, US combat troops had left the country. The television program kept going until the war ended in 1975. After the war, my mother found work teaching in a primary school. But after the freedom of her youth, Communist Vietnam became an intolerable place in which to live. Meanwhile, during the war, my father – Phạm Đức Thọ – had been in South Vietnam’s army but never saw Hoa Tình Thương perform. He met my mother some years later: he was organizing a boat to leave and she was seeking a passage. My parents settled in Australia towards the end of 1980, after a stint at a Malaysian refugee camp administered by the United Nations. During her five months there, my mother bumped into a number of other singers she’d crossed paths with from her days working on the television program. She never sang in public again, unless you count karaoke at parties. The ones who didn’t leave were silenced under the oppressive Communist regime. It took years for people to find their voices again, if they ever did. This is particularly true of Vietnamese music: when the war ended, so did Saigon’s lively music scene. 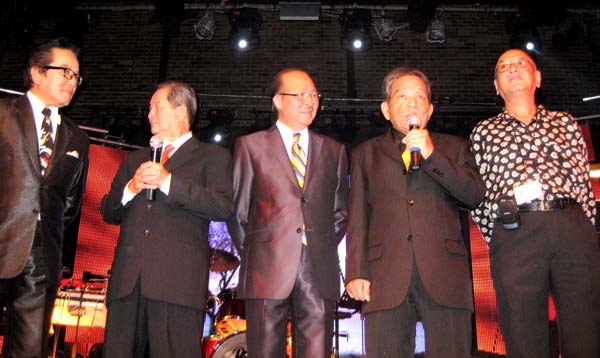 Most performers left the country, and the ones who remained in Vietnam (including Hoàng Liêm) hid their musical pasts because of a ban on music enacted by the Communist authorities. As a researcher of Vietnamese music, Jason Gibbs, has written: “The victorious Communists outlawed nearly all of the music created in the South.” But even so, he notes, “the rock culture of the South nevertheless seeped into the culture of unified Vietnam”. So, despite the atmosphere of fear, Saigon’s wartime beat survived and the songs of that era have gone on to become enduring classics, still heard in Vietnam and beyond. This is why the music of the Vietnam War is performed at concerts like Một thời để nhớ, which returned for a three-city Australian encore because the first tour had been such a success. Sadly, Hoàng Liêm never made it back for the repeat performance: he died on 19 March 2014 in Ho Chi Minh City, aged 77. Sheila Ngoc Pham is a writer, producer and broadcaster based in Sydney, Australia. She’s produced radio documentaries and programs for ABC Radio National including The Lost Cinema of Tan Hiep and Saigon’s Wartime Beat, and her writing has appeared in a wide range of Australian and international publications including The New York Times, Roads and Kingdoms, Womankind and New Philosopher. She is currently a PhD candidate at the Australian Institute of Health Innovation and lectures in public health ethics at Macquarie University. There are a couple points in this short essay that need clarification. First, Shotgun and the likes of music bands came into existence in mid and late 60’s of the previous century primarily to entertain American troops, where the singers and musicians draw their sources of income. Very rarely, if at all, did they participate in any form of entertaining the Vietnamese troops. For this purpose, there were troupes like “Hoa Tinh Thuong,” or the ones organized and sponsored by government agencies. They risked the danger of war to come to the troops’ encampment for variety shows and support..
Lastly, the acronym VTV1 is not the designation of the television channel operated by the government of South Vietnam. It is the appellation of the Communist broadcasting mechanism!.